Crum said Iowa State’s programs are far-reaching, both in terms of contributing to talent development in the state by supporting learning and skill development both on and off campus, and in the long-term and immediate economic development impacts that can be seen when Iowa State students’ talent is leveraged by businesses, startup companies and communities. “At Iowa State, the talent development pipeline starts early, even before students reach the university and can continue throughout an individuals’ lifetime through our programs,” Crum said. 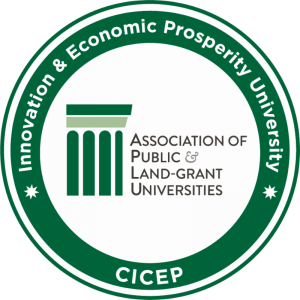 Kansas State University won the “innovation” award and the University of Maryland won both the “place” and top-prize in the competition, the “economic engagement connections” award, becoming the first university to become win IEP University Awards winner in multiple categories or in multiple years. There were five finalists for the 2017 IEP Awards. In addition to the four winners, finalists included the Georgia Institute of Technology and Pennsylvania State University.